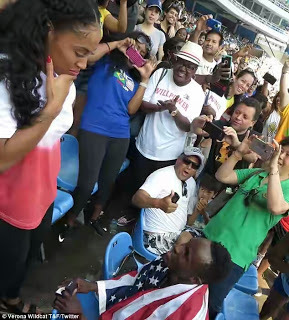 Moments after winning the silver medal, Team USA triple jumper Will Claye proposed to his girlfriend Queen Harrison on Tuesday. 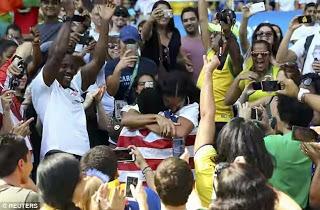 Claye became the fifth Olympian to propose during the games after 27-year-old Harrison, herself a hurdler and former Olympian, with a huge diamond ring. He climbed over a railing before being helped up a wall and into the seating area where he found Harrison before dropping to one knee on the row of seats in front. Harrison played it cool for a moment, resting her chin in her hand as she gave a quizzical look, before saying yes as the pair shared an emotional hug. ‘I told her she was my best friend. I told her she was my rib. I told her I want to grow old with her,’ Claye recounted.